On a mission to explore all aspects of the culinary world from the divinely decadent to the unbearably grotesque, Sōma Yukihira’s ultimate goal is to become a chef that can surpass his father. He’s shocked one day when his dad decides to close up the family shop for the next few years and send him to a prestige cooking school in the mean time. However, there is a catch – only less than 10% of the students graduate from this elite institution, and his father says any dream of beating him will be a joke if Sōma can’t succeed. I love this series. Heck, it's probably one of the top-three shonen series I'm reading each week right now. The art is great and just looking at the food makes me hungry and actually want to try the things they make in it. All of the characters are fun to read and Soma's a really good shonen protagonist. This series even has, imo, one of the best training arcs I've ever read in a manga series. There's soon-to-be 7 volumes of Soma released outside of Japan, and an anime is currently running. The anime follows the manga loyally and has up to 24 episodes for its first season. Right now, it's on episode 17 and will be featuring the Autumn Election soon after the Karaage battle in Soma's home town. The second opening and ending theme aren't as great, but I do like the first ones it showed in the beginning of the season. Definitely makes me hungry every time I watch it and I do follow the manga every week too. After this current episode, I realized there might be another love interest besides Erina and Megumi for Soma. I forgot all about Kurase Mayumi, who's had a crush on Yukihira since childhood. Arguably said, he could end up with anyone with all the woman falling for him. lol. Although, I'd prefer it if he doesn't fall for anybody until the very end, maybe? And I'm hoping this comes back for a second season once the manga is further ahead too. Manga wise, Yukihira is picking a fight with the 8th seat from the Elite ten, which is still nerve racking as ever. Hopefully himself and Megumi pull out of the red on the final day and get the 8th seat to acknowledge him and his cooking skills. And we still haven't seen what Alice, Akira and Ryo do to get out of the red or what their dish is. I'm hoping we see that soon! I'll probably have more thoughts on this once the new chapter is out in a few days or so. I now actually would consider eating tofu after this chapter. Well... actually I'd just want to eat Soma's Mapo Tofu dish. Or more specifically his "Countdown Curry Mapo Noodles." I love these chapters. Soma's starting to turn things around in a big way and show that he really is a lion to be feared. Was very surprised to have Soma bring Subaru in to help, but in a kinda hilarious way it makes perfect sense. Lol. Funny enough, I finally got to see episode 18 today! Mozuya makes the silliest and creepiest facial expressions; rivals that of Orochimaru. Definitely a good episode and makes me freaking starving for some chicken or in this case, karage. What I wouldn't do to get myself some to eat right now after watching this episode! Well, I'd say that was about as satisfying an end to this moon festival arc as could be. The whole chapter was good, but I can't help but feel that this exemplifies Soma's poor planning. It took him 4 whole days into the festival before his stall was even complete. I find that that's not truly praise-worthy. xD Lucky for him, his other friends decided to just up and leave their booths to help pull his rear out of the fire. Kuga shouldn't be so ticked. Sure, he got second place today in sales, but he's more then likely made a much higher gross income over the whole week compared to Soma doing good one day and having to climb out of the red. I've watched the new episode of Soma! :3 There's one thing that comes to mind. 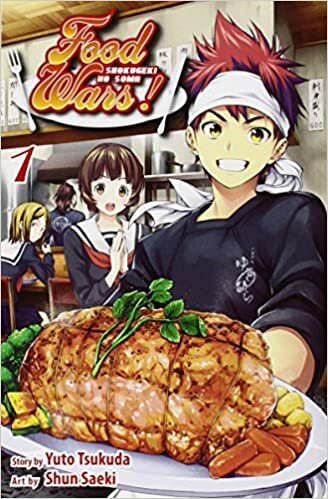 When is Yukihira ever going to be challenged to a Shokugeki from Takumi Aldini? 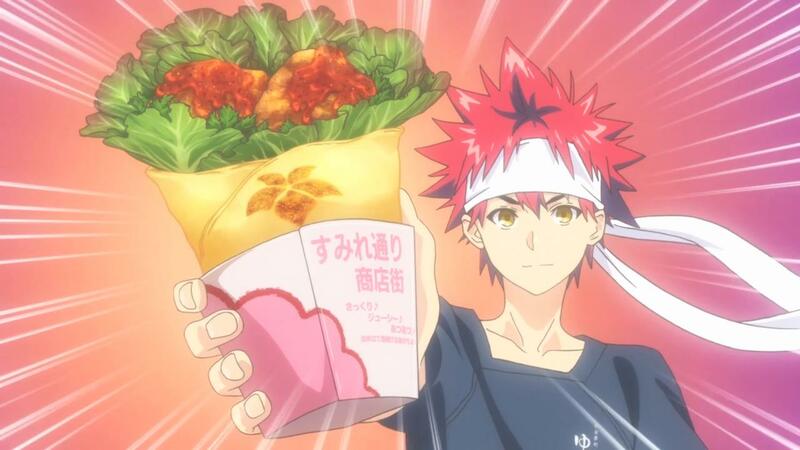 We still need to see that eventually happen, because Yukihira still has one of his culinary tools. Anyways, we learn about curry from Akira in this episode. Now that we know who's in the autumn tournament it ought to be good. The new episode is showing off the competitors styles in cooking with curry. I almost want to go back in the manga to find out what happens next because, I was laughing so much at Yukihira for sleeping as he sits in a stool cooking curry. Everyone else is left gaping at him as they're showing off right now. In the manga: OH MY GOD. We actually get to see Erina's father! I imagine this will be a lot different because, you can tell they're both slightly intimidated by his appearance. Goodness, this is becoming even better as we read on in this. Speaking of which, I like seeing the final reveal of Alice, Akira, and Ryo's dish. And I forgot this was a five day event instead of four days. I guess I shouldn't be surprised it's curry with chocolate featured in it. And let's not forget Kuga finally reveals what his bet/favor was with the first seat. I wish I had thought of it being related to a shokugeki but, I think after this he and Yukihira might become friends with similar goals and honesty. Really good chapter this week. Got the end of the festival and more things being revealed. It's actually kinda brilliant having Kuga and Soma be so similar, and then see how the outcome of their battle kinda went and screwed each other over. Now neither of them got what they wanted out of it. But yeah, it was cool seeing that Kuga did the same kind of stuff as Soma, so now maybe the two can have a better rivalry with each other. Very interested in seeing the First Seat's cooking since he's been built up a bit now. And we get to meet Erina's dad! :O We might actually get more backstory and character development for her, after over 100 chapters of her just kinda being the same, which is great! Seeing both her and Hisako be intimidated by her dad makes me wonder about a lot of things. Maybe he's kind of a terrible dad, or doesn't think highly of her cooking, which is why she has some kind of attachment of affection for Soma's dad. I want to know! Oh, and Alice, Kurokiba and Hayama weren't expelled. Hooray! Would have been quite the left turn if three major rival characters just got expelled and had to leave the series. But the power of chocolate apparently saves the day there. I started marathoning the Food Wars anime today. It's kind of amazing that the anime can actually make moments even more over-the-top than what the manga did. But, such is the power of animation! Been a lot of fun watching so far, no complaints about any of the voice actors so far, everything seems good. Although, I gotta say, this isn't a series you should binge on an empty stomach. It makes you hungry really fast. And makes me depressed at the lack of exquisite food in my house... and my lack of cooking skills. Lol. Very interesting chapter this week. The First Seat on the Council of Ten is pretty different then any of the other chefs seen so far. Firstly, it's easy to understand why this guy wasn't selling the most out of everyone in his area during the festival. Only three dang tables in a hall that huge?! That's some pretty specialized service he's got going. Kind of a neat setup thought. The big thing with him though is that he's the only chef in the series so far to "not infuse himself" into any of his dishes. 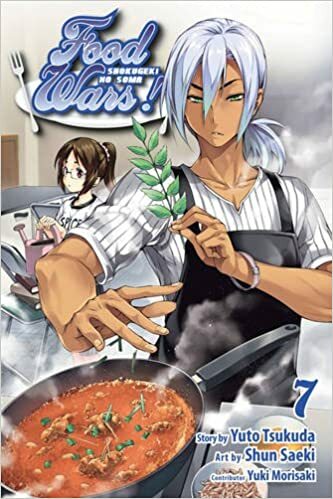 That's kind of a stark difference to other characters in the series, like Soma recently trying to find his own Yukihara-style of cooking, or Aldini's own style of Italian cooking. A chef that thinks he brings out the best in his food by not having his own twist on a recipe. I suppose that's sort of a style in and of itself? He certainly had a big effect on Soma and Megumi, and I liked the imagery of it being just Soma and the food in their own void, like it was the only thing that mattered. And it looks like Soma is finally going to insert himself into Erina's family drama. Which is nice because now we can see what's going on with that. Never seen Erina be so timid like that before. I thought he'd be similar to Erina in personality for being first seat. The thought of him being such a worry wart made a 180 on me because, it reminds me of how Kuga was egging him on to do a Shokugeki again from a mere favor. This guy doesn't seem like the type to enjoy confrontations and it explains why he looked unhappy at the thought of it during the festival about that favor. On the other hand, his cooking is out this world in the literal terms. Definitely unique. A nine course meal doesn't surprise me either. I'd say what he does is rare because, he brings out the dishes flavors on their own and into a living thing almost. I was also equally surprised how he got fifth place for doing only three tables at once. Furthermore, I do imagine the Elite ten have to do Shokugeki's of their own because, they do have upperclassmen to face off against. I recall the one chapter before all of this started when Yukihira proposed one and was turned down instantly. I kind of doubt they'll all graduate for everyone to take their places because, some of the Elite ten could've easily signed on to be apprenticed by mentors already. So, I think this is a hurdle of taking their spots or facing off against others in a shokugeki until graduation. Eh, I'm getting off track. Erina has only been flustered, confident, or haughty from chapter one. I'm dying to see the next chapter and find out what her father is like. The idea of Yukihira inserting himself into her family drama will have one helluva outcome. I imagine Erina might forget herself with his presence there until she's scolded about it and has to cook for her dad. Upon reading this chapter it blew my mind. I need to see next week's chapter stat! Azami Nakir gives me the creeps on so many levels. I've never seen Hisako or Erina so relieved to see Yukihira before. To see everyone so riled up at a man who was banned from the institute and infamous is quite astonishing. Rightly so, when he's freaking insulting everyone left and right. Heck, I didn't expect to see the judges from the autumn selection either. I actually feel like I pegged Erina wrong with her haughty attitude after seeing her father. And I can see why Erina took a shining to Yukihira's father. I wonder what became of her mother then? (I don't remember her being said to be dead.) And with that thought in mind, I can't help but feel "proper education" is a lot worse than what I'm imagining right now. I won't be theorizing about what'll happen in the next chapter because, I feel the need to be surprised, and this is quite the character development we're getting too. I hope Yukihira saves the day somehow though. I caught up on the anime, and all it took was a weekend to do it! Now it's left off right where volume 7 ended, and I'd like more. Now I can follow it week-to-week better now. The manga has been so good these past few weeks, with the first seat last week and now Erina's dad this week. I get the feeling Erina's dad is going to be about as big of a scumbag as that school director from Assassination Classroom. Okay, so this chapter pretty much gave us two things that probably, greatly influenced Erina into becoming who she is today. If you thought she had a stuck up attitude before when it came to people's cooking, then her dad completely blew past that. This guy is such an a-hole, talking to all those other high-end cooking people like they're garbage. It's kinda easy to see where Erina likely picked up some bad habits from her dad before he was banished. The other part is how Soma's dad planted her motivation in the series. She really liked Jochiro's cooking and wanted him to like hers, so he said he'd come back to taste it when she became a great chef. I'm slightly worried that that might have unexpected negative consequences: because Jochiro didn't show up this year to eat her food, she thinks she still isn't great yet, and thus she'll keep striving to improve herself. That's fine in a way, but Jochiro has been compared to as a wandering alley cat, so if he doesn't show up for years because he's out in the world, then I fear Erina's cooking might get out of hand. But after seeing what her dad is like and how she acts around him, it's easy to see why she'd grow attached to Jochiro. Next week will be the finale of Shokugkei No Soma's anime! I'm kind of heart broken because, I really enjoy the anime and its sensual food. I don't know what I'll do to pass the time after its over and I'll have to stick to the manga again. I hope they create a season two in the future because, this was phenomenal to watch. Anyhow, I'll talk about this week's episode. Spoilers below. I laughed so much during this because, the female judge was having a bunch of food-gasms the whole time, and I couldn't take it seriously. I have to say this was a lot of fun to watch because, we got to see each contender with their curry dishes before it narrows down to Hayama and Yukihira's curry. I really want to try the curry dish Akira did, and I dislike udon noodles, so I probably wouldn't enjoy four eyes glasses as much. Anyhow, the way it ended on a cliff hanger with Hayama's curry dish makes me want to see the finale that much sooner. I forgot what was in it or what kind of curry he made, which reminded me of a souffle or pie a little. Therefore, I'm eager to see how it ends and hoping we get a season two! Figures, I catch up on the anime and it's ending next week. Oh well, it was fun marathoning it anyway. Kind of an odd spot to leave off on, right at the end of the preliminaries, but I suppose it's the the best way to not have an oddly numbered anime season, or something. I hope season two happens! Super-fast episode getting through so many curry dishes. I did enjoy all the other Polar Star dorm members getting their chance to show off a bit. The Master of Fermentation! The Professor of Taste! The Prince of Smoke! It's too bad they haven't done as much in the manga since then. Lol. Food Wars has been on fire the past few weeks. Lately I've been getting similar One Piece vibes where big things are set up post-arc, and are gonna lead into some really good things to read. Heck, I'll even say that Azami Nakiri is the best villain in Shonen Jump right now. The thing I'm most pleased about from the latest chapter is how involved the Council of Ten is finally being. After so much build-up, and saying how they have so much power, we finally get to see them do something that affects the story in a pretty dang big way. And surprise, giving a bunch of teenagers absolute decision-making authority at a school probably leads to not-so-great outcomes for our protagonists! God, Azami has only had two major chapters dedicated to him, but he's swept in and become the "big bad" for the series, something that we never really had before until now. It makes sense, Erina was probably the biggest antagonist Soma had, but she's definitely become less antagonistic toward him, and a bit more friendly in certain situations. Her a-hole dad makes for a logical next step in escalation, and he sure as heck proved it. I can only assume he offered those Council of Ten members something pretty enticing to gain their support, something they wouldn't get from keeping Senzaemon in charge. (I feel bad for the guy, getting fired by his own students like that.) What's really interesting is that the second seat, Rindo, thought that Soma would jump at the chance to get whatever Azami was offering. Makes me curious what it is, since Soma would never get along with someone like him to begin with. Other then that we still have the "CoT" members that haven't been formally introduced yet, numbers 3-6; and of them only the third seat opposed having Azami as the new dean. Lots of things set up that I'm really looking forward to now.